LARGE SIZE - 181"(L)X45.5"(W)X52" (H), 169" long from tip to tip, 178" long from hook to hook. Fit for 12ft-15ft hammocks. WORKING LOAD - 550lbs, Capable of single, double or extra wide hammocks. Designed for two adults, this hammock stand is easy to carry out for any outdoor relaxing time. COME WITH 2 STEEL CHAINS - 2 X 13" Steel Chains Included. If your hammock is not long enough, please add the 2 chains to the stand, then, it will be available. 2" diameter 12 gauge heavy duty steel structure, rust resistant finish and black powder coated. SPRING PIN CONSTRUCTION DESIGN- reinforces stability of interlocking poles, easy to assemble & adjust, do not need tools. Durable vinyl caps protect all pole ends. Supports single, double or extra wide hammocks. Signature Right Connection featured, 360-degree welding for superior safety. COME WITH A CARRY BAG- make the stand become easy to be stored and taken out. More convenient than other stands. Backed with 1 year manufacturer's warranty for buying with confidence. If you have any questions and suggestion, please feel free to contact us, Zupapa will reply ASAP. Zupapa brand anniversary is coming, in order to express our gratitude to our customers, we provide big off for this item. This price is only available for 3 days! Please catch chance to buy! This 181″ long hammock stand is just what you need when there’s no perfect setting to hang your hammock. An afternoon reading time in patio, having a cozy nap at the backyard, happily enjoying sunbathe at the beach, or even camping in the forest, no matter what you’re going to enjoy, there’s always one hammock out of our variety kinds and styles will suit your demand! Material: Made of heavy gauge 2″ /5cm diameter steel, black powder coated finish for a decent, expensive look. 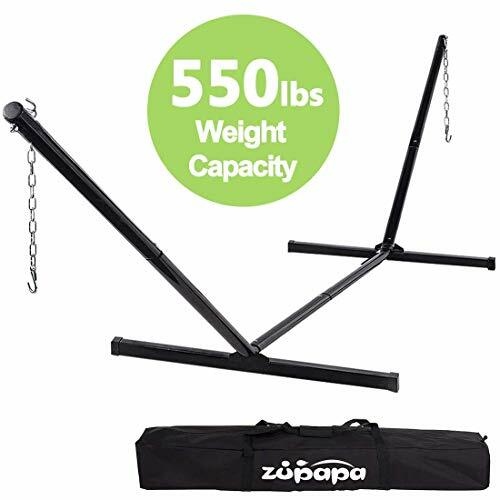 Weight capacity: 250kg/550lbs. Supports single, double or extra wide hammocks. And this item also comes with our 100% satisfaction guarantee, please rest assured to buy.